In August I blogged about the paper-y aspects of my oldest son's wedding. After the post went live, friends asked, "But what did you quill for them?" "Ermm, I didn't," I had to admit. I wasn't sure they are all that fond of quilling, and let's face it, a marriage certificate is a statement piece that needs dedicated wall space on which to hang. And so I began thinking of quilling a mat for their invitation as a Christmas gift. 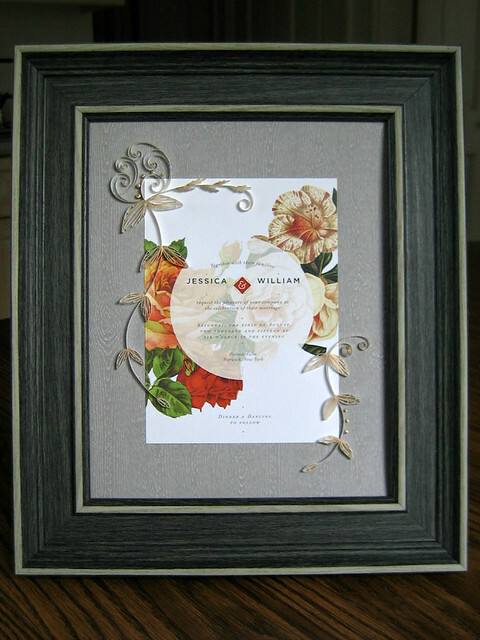 Once I was pretty sure they hadn't already received a framed version, I planned the design for their Monica O invitation. The layout is a variation of my most popular design. To make it one of a kind, I repositioned the abstract flower and swirled tight coils within the bloom. The flower and leaves were quilled with Lake City's Touch of Gold. I love metallic edge strips and generally opt for the ultra-shiny ones by JJ Quilling Design, but Touch of Gold's subtle gleam goes well with the understated frame and wood grain mat. On the other hand, tiny tight coils made with JJ Quilling Design gold/gold edge paper add a shiny accent. I was delighted to find the two-tone gray frame at TJ Maxx and practically pranced it out of the store. Not only is there space between glass and mat to accommodate quilling, but its rustic look seems right for a farm-wed, millennial couple. 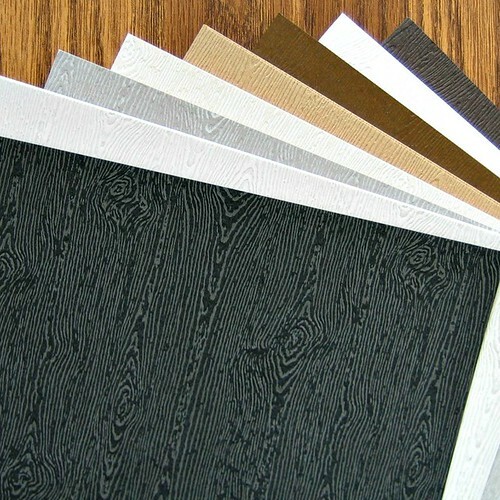 The same thought goes for the Gmund wood grain card stock used in place of more typical mat board. 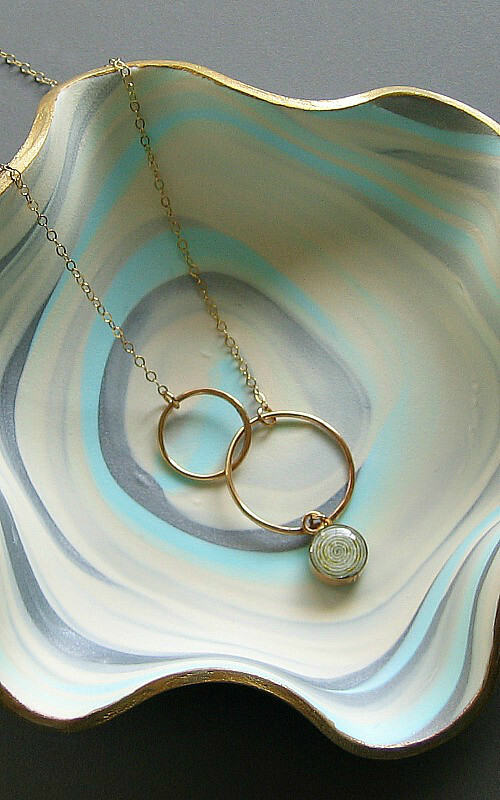 I chose this necklace and marbled clay dish as Christmas gifts for our daughter-in-law. 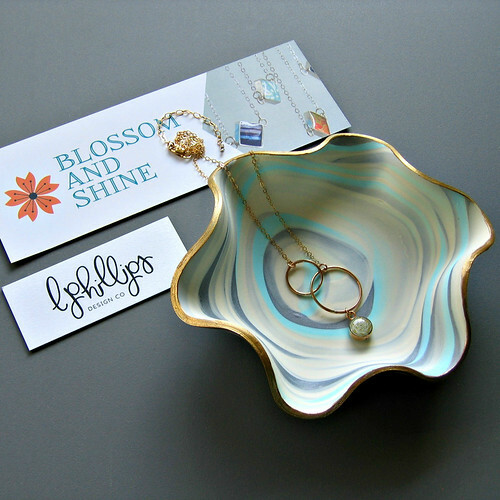 You might recall a previous post about the lovely metal/paper/resin jewelry made by Julie Dye of Blossom and Shine. I'd admired the double ring gold necklace she creates (the wedding was still firmly in mind) with an attached rolled paper bead, and wrote to ask if she might be able to make a gray bead even though it isn't one of her standard colors. Julie responded that she's happy to work with customers on custom pieces and happened to have a piece of Japanese chiyogami on hand that she thought would roll up beautifully. Look! 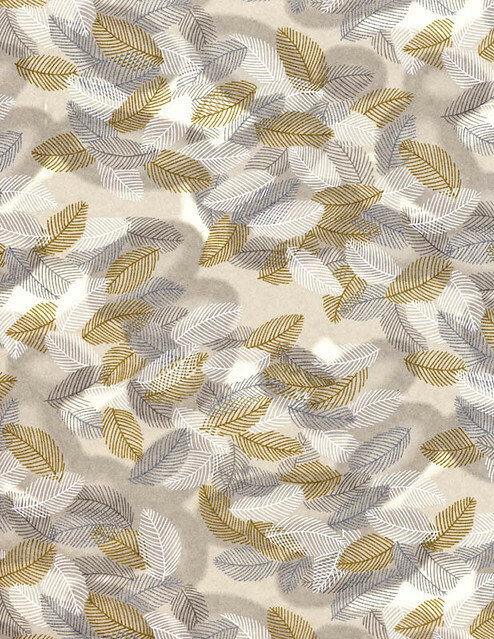 It's metallic gray and gold - perfecto. Last but not least, the "trishdish" was made by Trish Phillips of Etsy shop L Phillips Design Co. I met Trish via Instagram where I stalked her feed obsessively while deciding on a color combination. I think the gold, gray and mint are beautiful together. And Julie was right, the gray bead is so pretty with its subtle flecks of gold. Everything is so thoughtfully tied in, Ann. 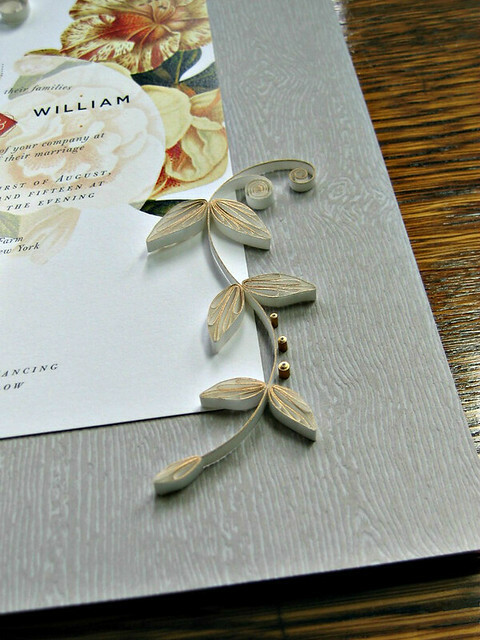 The understated colors let the invite shine, and your quilling is complementary as ever. Wow! What a lucky daughter-in-law! It's all just lovely, Ann! I agree with Stefani - details make me happy, too! Great work as usual, Ann! Hope you had a wonderful holiday! Aw thanks, Karren! Here's to detail people. :) Yes, wonderful holidays here and I hope yours were too. WOW...what a delightful color combo - beautiful work too! Such thoughtful gifts Ann. 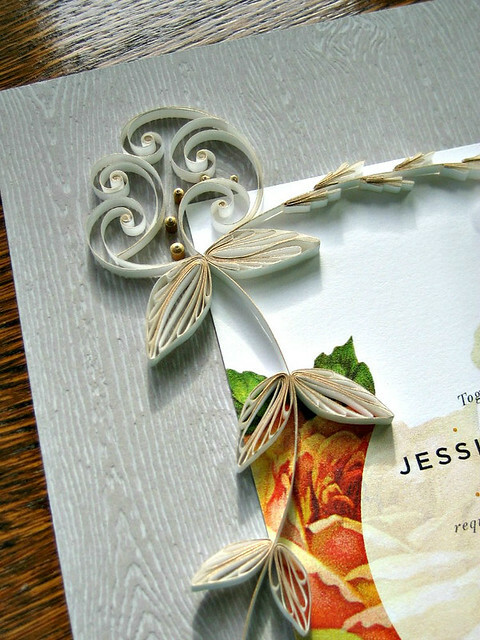 Your quilling elegant as always adds so much to the invite. How can you not fall in love with that clay dish and necklace. Beautiful!! !